Summer Sunrise Yellow Rose and Orange Red Mixed Flowers Silk Floral Wreath for Front Door Indoor Outdoor Summer Decor by Wreaths For Door at Sacred Hearths LA. Hurry! Limited time offer. Offer valid only while supplies last. Summer Sunrise Silk Floral Wreath is handmade on a sturdy grapevine base and filled with yellow roses and assorted orange and red summer flowers. Summer Sunrise Silk Floral Wreath is handmade on a sturdy grapevine base and filled with yellow roses and assorted orange and red summer flowers. Hang this colorful wreath filled with a colorful mix of spring flowers on a front door or use as an accent piece by hanging on a wall or above a fireplace inside the home. May also be hung out door in a weather protected area. Measures 22 inches in diameter and is 6.5-7.5 inches deep. Due to the product shifting during the shipping process a little fluffing may be needed. FRONT DOOR WREATH Welcome friends and family with this beautiful Easter, Spring or Summer Door Wreath. Handmade on a sturdy grapevine wreath base and filled with yellow roses and assorted orange and red summer flowers. DECORATIVE WREATH Hang this colorful spring or summer decorative accessory in a kitchen, dining room, living room or above a fireplace. GREAT HOME ACCENT PIECE Perfect for spring and summer, this beautiful floral home accent piece is suitable for traditional, country, or shabby chic interior decor. 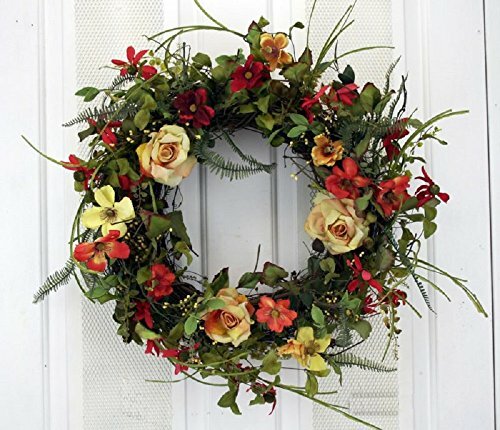 HANDCRAFTED Measuring 22 Inches in diameter and 6.5 - 7.5 inches deep, this beautiful garden flower filled wreath may also be used outdoors, but only in a WEATHER PROTECTED AREA. WREATH IS NOT WATERPROOF.